NEW YORK (CNS) — The opportunity to watch a biblical interpretation on the big or small screen can be a mixed blessing. It’s certainly something of a novelty, given the current television culture, to see the story of Jesus’ earthly life — or its aftermath — unfold in a mass-media format. Yet audiences are at the mercy of the directors’ vision of the New Testament — and of its leading personalities. Franco Zeffirelli’s sweeping 1977 miniseries “Jesus of Nazareth” artfully told the story of the Savior’s birth, ministry, death and resurrection. But some critics at the time bemoaned its mostly lily-white roster of stars. Director Mel Gibson’s 2004 movie, “The Passion of the Christ,” may have wooed audiences to the tune of $600 million worldwide. Yet it was met with controversy over its harsh violence and what many considered the anti-Semitic lens through which Gibson focused on the events he recounted. For most of the following decade, there was a lull in Scripture-related offerings — and faith-hungry television viewers felt it. Producers Mark Burnett and Roma Downey have devoted the last few years of their careers to changing that. With their production company, LightWorkers Media, they produced 2013’s “The Bible,” a 10-hour History Channel miniseries watched by over 13 million viewers, according to Nielsen. “Son of God,” a feature film based on footage originally shot for the miniseries, was released to theaters a year later. Now Burnett and Downey have given us the 12-week miniseries “A.D. : The Bible Continues,” premiering on NBC Easter Sunday, April 5, 9-10 p.m. EDT. While the project will obviously be welcomed by audiences looking for faith-affirming television, the results are uneven. “A.D.” begins as Jesus (Juan Pablo Di Pace) is condemned to the cross by Pontius Pilate (scenery chewer Vincent Regan). In the immediate wake of his death, the apostles, though united in mourning, are otherwise divided, aimless and scared. Relations between Jewish leaders and Roman officials are worsening by the day — a dynamic of mounting tension that the series captures well. 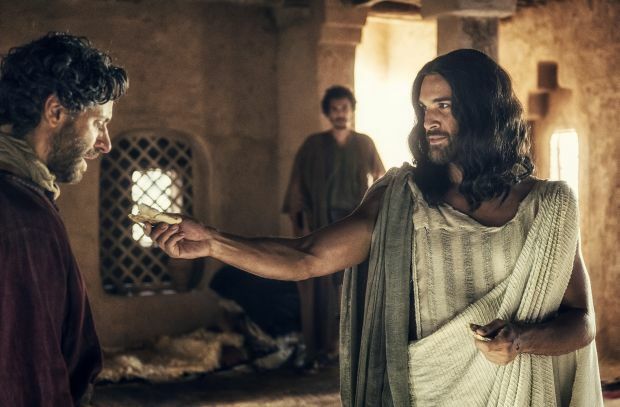 Much of the action in the first two episodes centers on Peter (Adam Levy), John (Babou Ceesay) and Simon the Zealot (Fraser Ayres) who are in hiding as they await Jesus’ resurrection. Peter, struggling with doubts over his master’s promised return, is also wrestling with the shame of having denied him. In these early moments, Levy is given the creative space to paint a portrait of a man crippled by despair and exhaustion, but clinging to shards of hope — and the actor never makes a false move. The remaining apostles — many of them portrayed by unknown players — realistically convey a kind of fight-or-flight panic. Mary Magdalene (a powerful Chipo Chung) and Mary the mother of God (Greta Scacchi, who rises above her own miscasting) are unwavering in their faith in the Lord’s promise. And it’s that subtle push-and-pull between the believers and the doubters that generates moments of truth and discovery. But not all of the story lines are captured quite so well. Pilate, in a total departure from the Gospel figure, isn’t a morally conflicted leader trying to keep the peace with the turbulent masses. Instead he’s a cartoonish, sepia-lit villain straight out of the “300” franchise. Hampered by a lazy script, Regan, no slouch of an actor, is given little more to do in the series than oscillate between lethargy and rage. The latter is directed mostly at the high priest, Caiaphas (Richard Coyle), Jesus’ primary antagonist. Some of Pilate and Caiaphas’ heated exchanges — so overwrought they feel as though they’ve been lifted from an old episode of the 1980s nighttime soap “Dynasty” — disrupt from the central narrative. A safe haven for viewers can be found with the remaining apostles. Jesus’ initial return is handled with admirable restraint. But when he departs again at the Ascension, the darkened skies open to a light show resembling an aurora borealis on steroids. Such overdone special effects only complicate a simple story. Jesus came to redeem, after all, not to dazzle. Indeed, it’s precisely the least garish moments that are most effective: Mary Magdalene’s almost wordless reunion with the risen Lord is simply stunning; Peter’s inner battles are conveyed beautifully in Levy’s pained face; and Ceesay’s representation of John’s quiet indignation provides some of the series’ most memorable scenes. In these moments, “A.D.” will truly resonate with audiences. Burnett and Downey should be commended for presenting Christian audiences with spiritually rich programming. Even so, they would be wise to apply a less-is-more approach as the series progresses. Additionally, there are a handful of intense moments — including the Crucifixion — that might be too graphic for younger viewers. The series, to its credit, encourages us to consider the sheer gravity of Jesus’ sacrifice — which is a powerful tool for Lenten reflection. Similarly, as the risen Jesus appeals to his brothers to go out into the world and risk death to share the Good News, viewers are likely to feel an inner spiritual urge to apply this missionary command to the circumstances of their own lives. Burnett and Downey’s project is, in sum, an admirable — though flawed — glimpse into fledgling Christianity as the first evangelizers bravely move forward, their hope renewed by the Resurrection. The miniseries continues Sundays through June 21, 9-10 p.m. EDT each night. Heffron is a guest reviewer for Catholic News Service. He writes about television and pop culture for St. Anthony Messenger magazine and Franciscan Media. PREVIOUS: Movie review: Do You Believe?